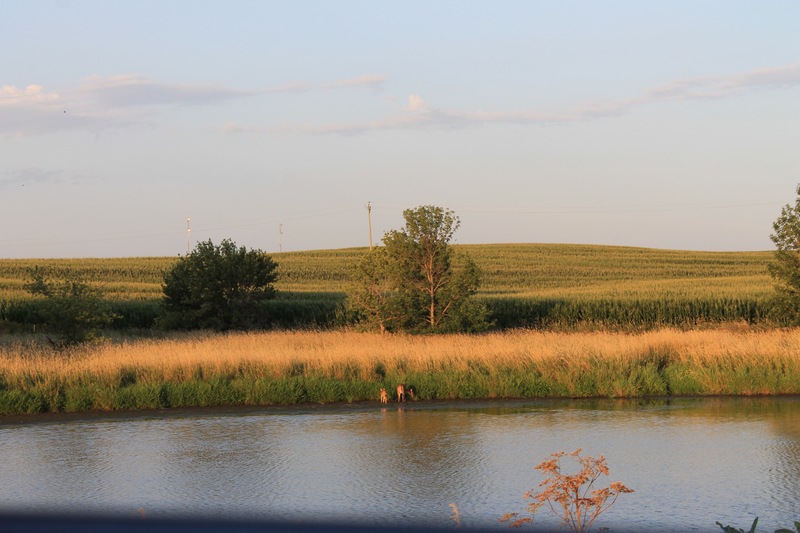 After leaving Des Moines, we moved for the weekend to south-western Iowa, just outside the town of Creston, to Green Valley State Park. First, after a few days with just electric hookups, we were happy to have all the services: 50 amp electric, water & sewer! All the sites here have some sort of lake view, there is a small beach, boat ramp, hiking & biking trail, and even some cabins to rent. But the best part about this park was the peace and quiet and darkness! Even as the park filled up for the weekend, it was still a nice quiet park. Birds calling all the time. The lake here is a man-made lake with many campers bringing their fishing boats out in the morning to fish for large mouth bass. Clouds in the west can’t stop a sunset on the water! 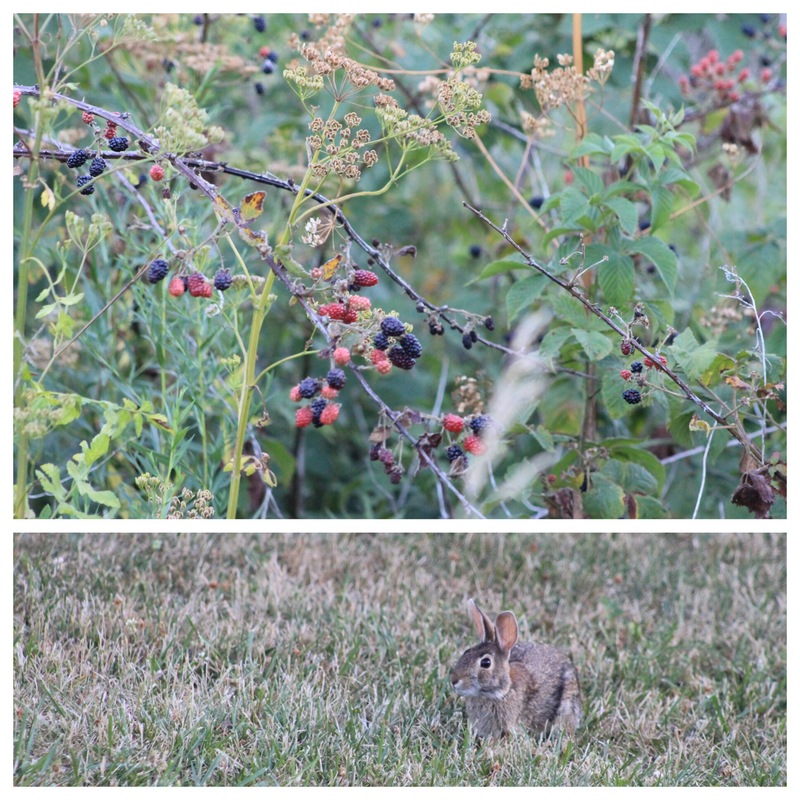 Once, a long time ago, we picked wild blackberries and I came home with chiggers and seed ticks every where (they like to go in all your creases, around your ankles, behind your knees, and further up, if you know what I mean!). So, no matter how delicious or thick they look, we don’t go in to pick them any more! I purchased lowclearances.com map download and got to use it today! Our coach is 12’9″ high up to the top of the old satellite dome on top……this train bridge was not a problem! But we still held our breath as we drove under it! One of the troubles I have run into is finding a good GPS program for us. I have researched and read all about Garmin and Rand McNally and everyone else without coming to a good decision. Every one of them has mixed reviews and in the year 2017 I feel that there should be a GPS that has more good than bad reviews! In the meantime, I map our route the night before we leave on Google with the low clearances layer added. After I determine the safest, easiest route, I use Waze while we drive; Waze is a live traffic/navigation app that gives great clear directions and live updates (police ahead, construction, hazards, etc.). Little things that make a big difference! 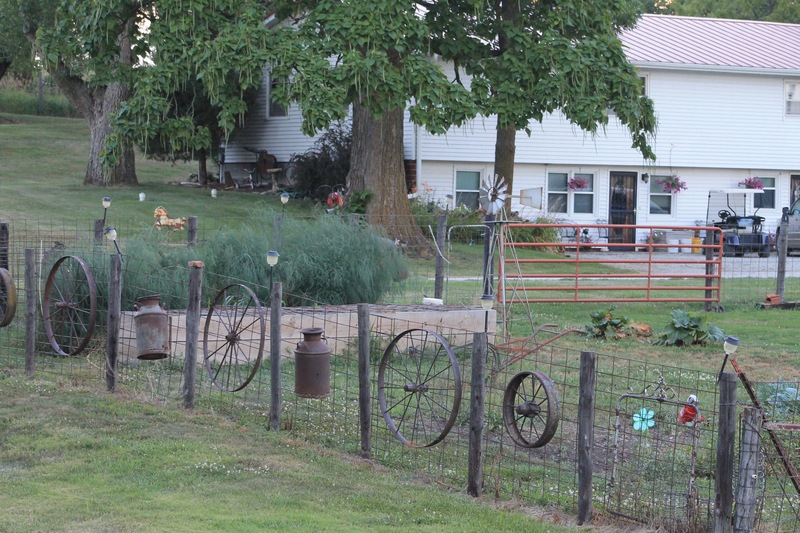 Although it was still a holiday week, we moved to Hidden Valley Outfitters Campground (HVO) near Bennett Springs, MO. I have never been to this part of the state and looked forward to visiting the springs. However, due to the holiday, Barry was not able to book any appointments in Springfield or Joplin. Instead, we found time to visit with family and relax!!! First though, the campground: a Good Sam campground and a discount! It has a funny little entrance to the area — they are currently in a little metal building and nearly finished with a new big building across the way. 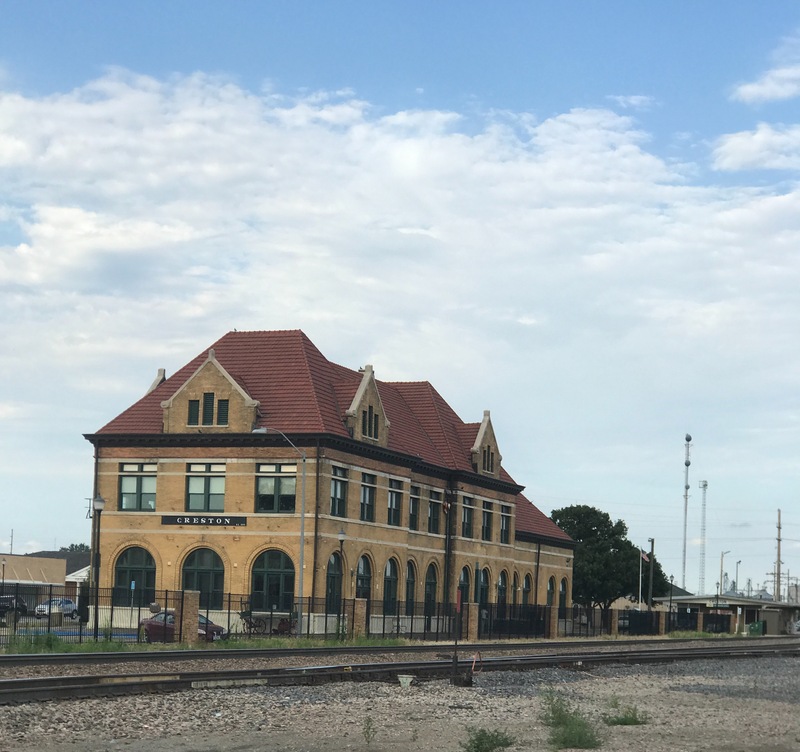 It looks like an old-style Old West building with a long front porch, but will include a water feature out front……worth returning to see the finished project. After you check in, you drive between the Niagua River and a big field before the campground comes into view. 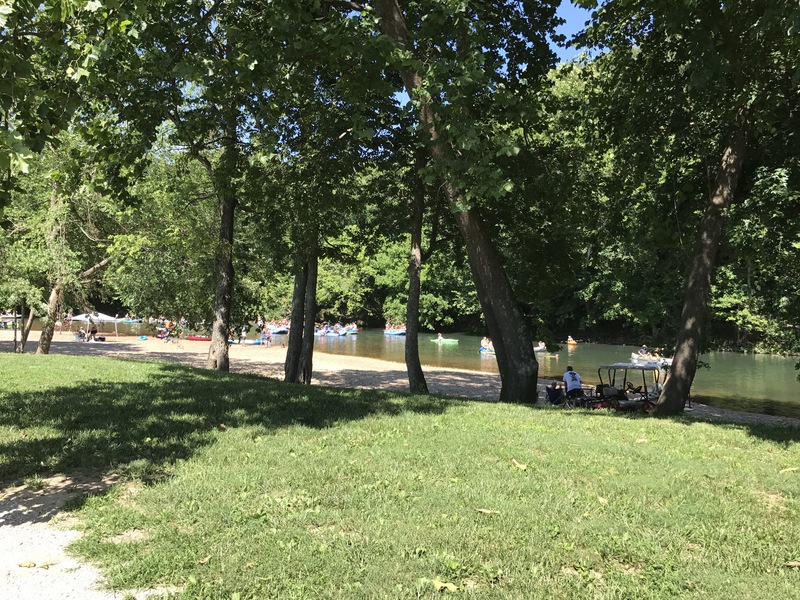 There are about 4 rows of campsites in this area with 50 amp, FHU’s, a campground, picnic shelter, river access and a nice shower house. Continuing along the road and over a low-water bridge into another campground for tents and smaller campers with 30 amp electric. In this area is also a little chapel and another nice playground and shower house. Up the hill is a third camp area for “extended stay” units — this is a huge property. We stayed here for 7 nights; but had to move from site #38 after 5 nights to site #37. Site #38 is the first site as you come into the campground and faces the river. It was a wonderful place to relax with the first shade every afternoon and the view of rafters floating down the river. 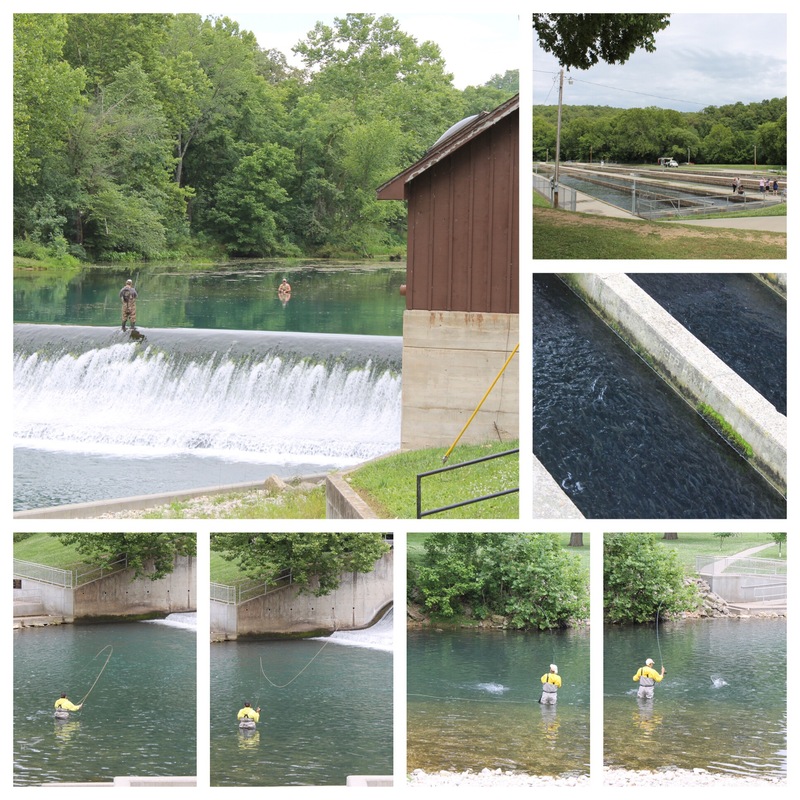 And the fishermen…….everyone comes here to fish for the trout released just upstream at Bennett Springs State Park. 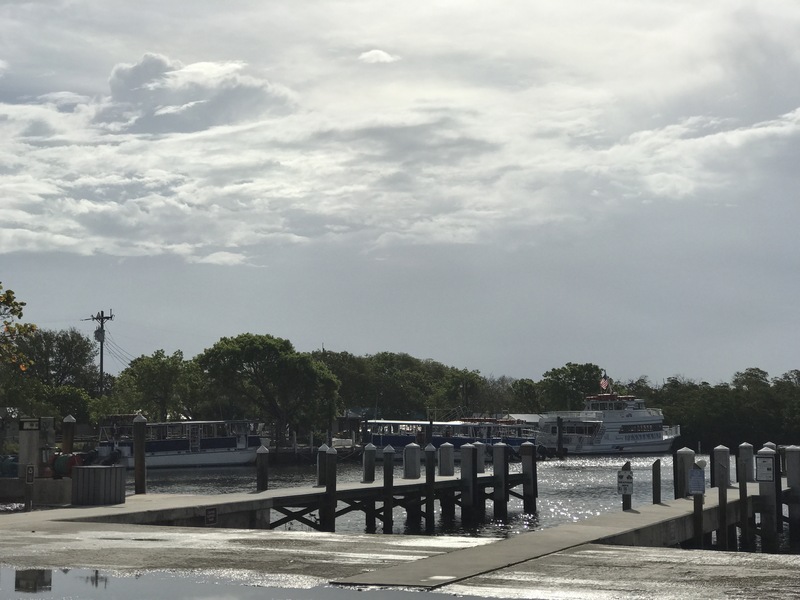 There is so much to see and do at the state park; fishing, shopping and eating in the lodge, trails, lots of wildflowers, multiple campgrounds (those reservations are as hard to get during Trout season as the ones in the Florida Keys! ), pool, playground, even the Bennett Springs Church of God. We ate breakfast at the lodge one morning and it was delicious; the lodge was built by the Civilian Conservation Corps in 1930 from stones and timber frames. The state introduced 40,000 mountain spring trout in 1900 and purchased the spring and surrounding property in 1924-25. I was not always an outdoor person, we never camped as we grew up and I did not take my family camping……so these moments are all new to me. 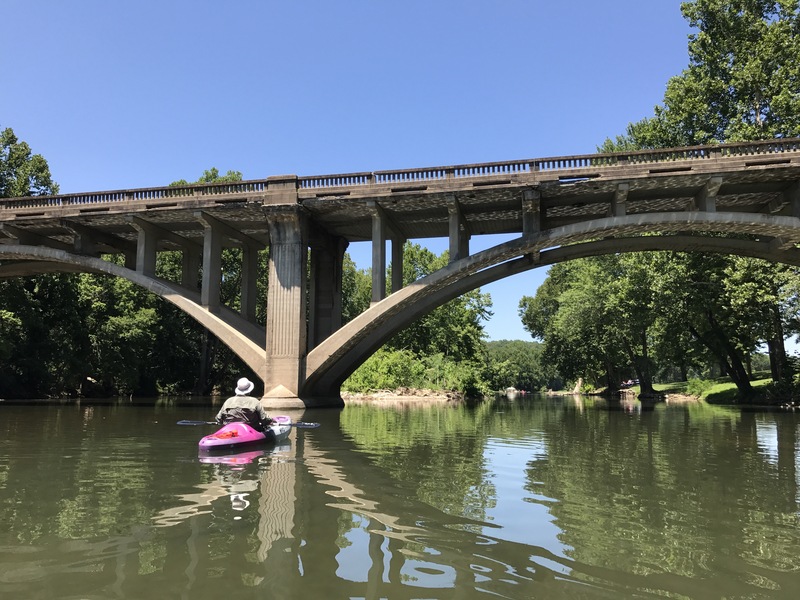 I have never been on a river float trip — until now! HVO offered float trips and we booked a Saturday morning time! Barry and I met other floaters at the picnic shelter and were picked up by their van driver. People brought coolers and float tubes and more coolers and sunscreen and music players and more coolers! It seems that loud music and drinking are major parts of floating on the river! We drove back up north of the state park for about 7 miles until we reached the drop off site. A couple of men were there with rows of rafts, canoes, and kayaks lined up along a gravel bar for us; one pointed to two kayaks, made sure we had paddles and life jackets and walked away while we loaded up our water bottles and sunscreen and pushed off. Poor Barry was a bit unsteady and fell right into the water as he tried to get into his kayak (!!). I was already paddling into the current and paused to just float until he caught up to me. Our trip was wonderful!!!! The water was comfortably warm and kept us from getting too hot. 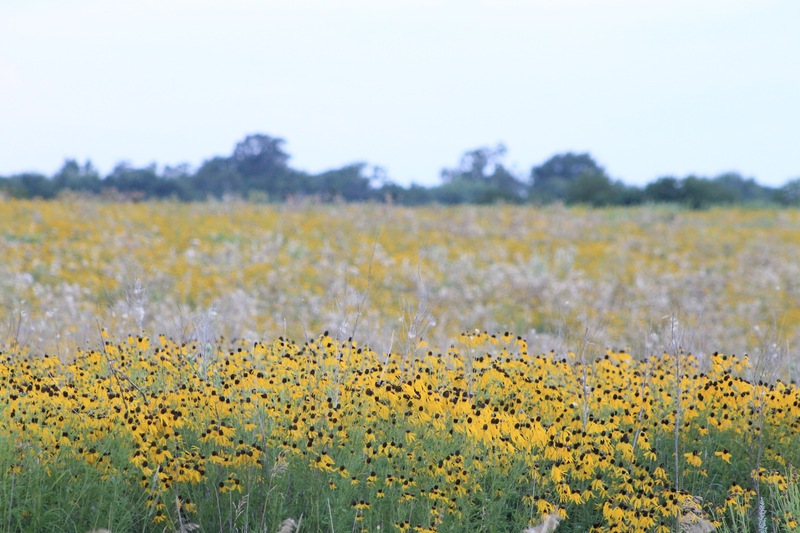 We saw wildflowers, huge trees, fish, turtles, snakes, lots of birds and many other floaters. We floated by tall old trees, towering cliffs, dead tree snags, with bird songs accompanying us. We stopped a couple of times to get out and swim in the warm water. We finally came up to the spot where Bennett Spring met the river……the water dropped from warm to so very cold! Then we came back to the HVO gravel bar and landed our kayaks there with the waiting boat team. We walked back to our coach, tired and hot and happy. After a lovely week, we packed up and drove back to St. Louis for some family time. For many years, we enjoyed sharing a “lake house” with my in-laws. Nothing fancy, just all full of used furniture, discounted carpeting, and comfortable love. But as our sons became men they moved away from Missouri and the house became our burden……upkeep and yard work and lack of time. And things change and we sold the house. 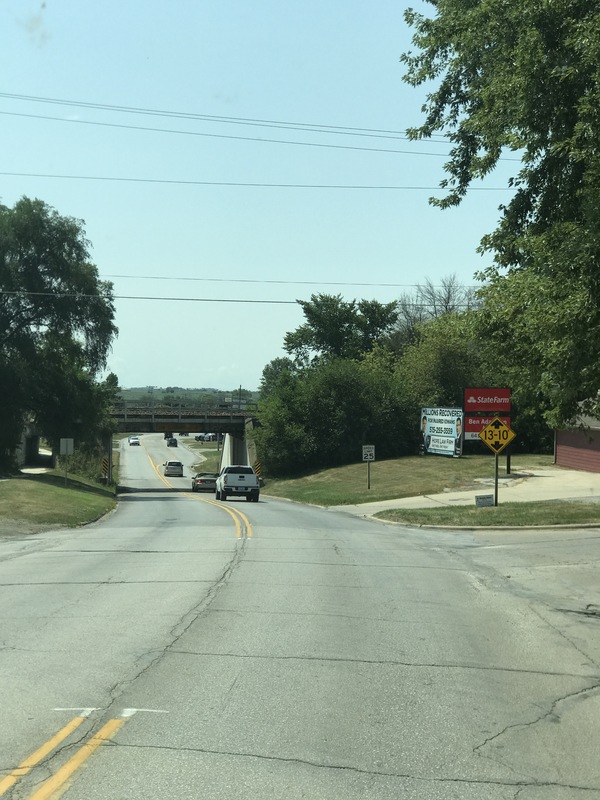 We have not been back to the Lake of the Ozarks for at least 5 years and, with our RV, we really did not intend to go back. But the Fourth of July was coming, we needed to move, and I found a campsite at the Lake of the Ozarks State Park. The Lake of the Ozarks is an engineered, hydro-electric dammed body of water fed by many area rivers and streams. It is set in the middle of Missouri in the Ozark Mountains (the only “mountains” between the Appalachian and Rocky Mountains). The area is hilly and rocky and hilly and dry and hilly; well, you get the idea…….I looked online at every site in the park and checked the slope on each one to find the most “level” site before settling on a 1.8″/10′ slope and hoped for the best. 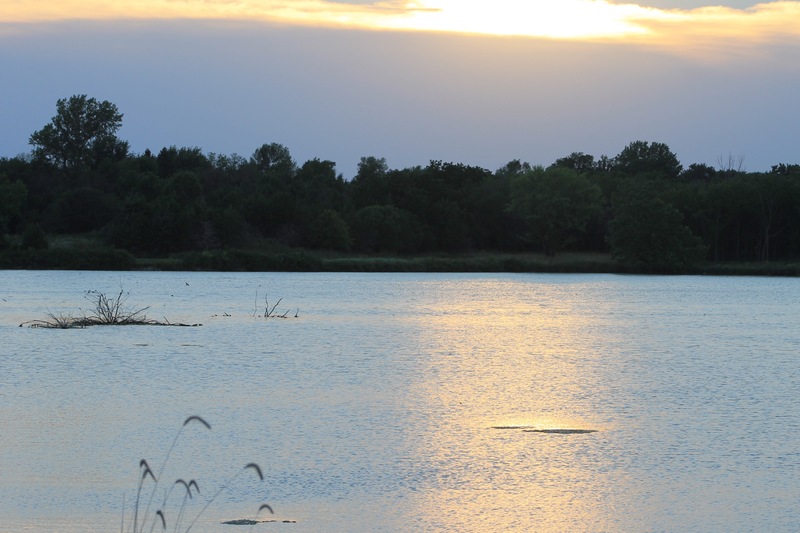 This state park is cut into several sections, some separated by long lake fingers of water and the campground is away from the main body of the lake on the GrandGlaize arm. It begins at the highest point along a ridge and falls down rapidly to lake level with 5 separated campgrounds along the way. The first campground has the only 50amp sites long enough for big rigs, but there were no water/sewer hookups. 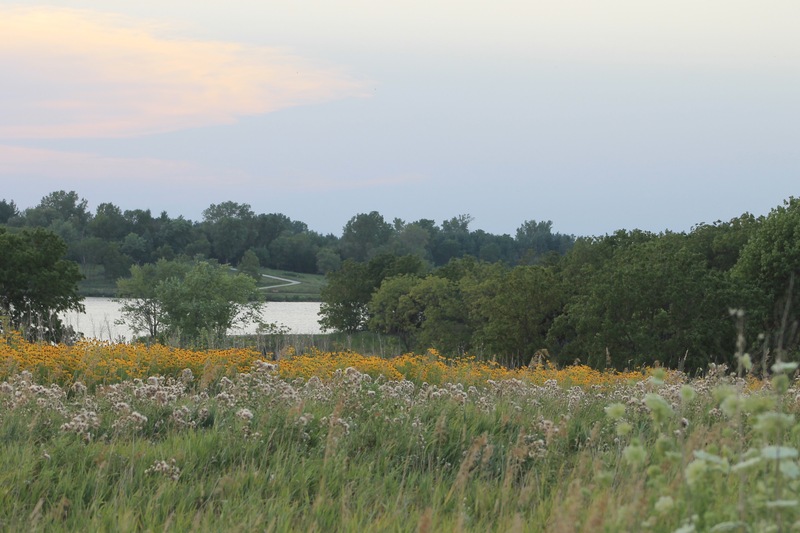 The park is very nice with history and hiking/biking trails, horse-back riding, an airport, playgrounds, camp store, boat launch and 2 sand beaches (man-made). The shower house near Campground #1 was just nasty…..funny story though…….as I was entering the ladies side to shower one morning the door was latched from the inside. An older gentleman and his wife came to the door, unlatched it and left together —- whaaaattttt? We did have fun during the weekend meeting up with friends we haven’t seen in a year or so, checking out some of our previous hang-outs and just relaxing. No more coughing, feeling better every day. Our grandson is the primary reason we travel to Ft. Lauderdale; we love our son, daughter-in-love, and her parents, but He is the reason! This trip centered around his 2nd birthday and all the fun for that time. As a two year old, Ansel loves big machines, construction equipment, fire equipment, big trucks……..but specifically Trash Trucks! For the last 6 months, he has loved everything to do with trash: putting stuff in the can, emptying the can, taking the container to the street, and watching the trash man in his trash truck on the street. His tears can often be abated with the words, “Will you put this ___ into the trash please?” And so, it goes without saying that he would have a Trash Bash Birthday! 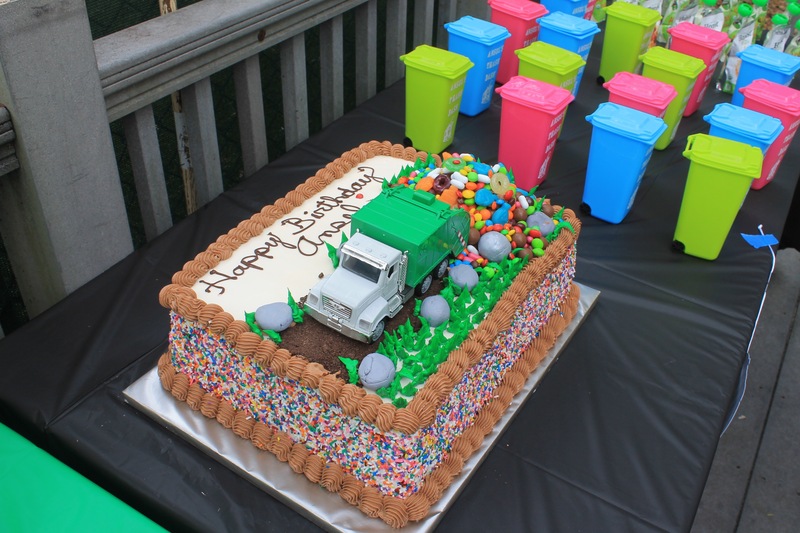 My daughter-in-love had trashy invitations, trash truck banners, trash can party favors, even a trash truck cake! The rain held off (for the most part, it is back to that 2 minute rain cycle again) and many of his pre-school and church friends came to the playground to celebrate with him. As the saying goes, “You know it was a good day if you didn’t hit or bite anyone,” so this party was a success. While we were in the area, I spent an hour (until it started raining, again) at Hugh Taylor Birch State Park. This is a tropical oasis right in the middle of Ft. Lauderdale at the beach. Seriously, once you drive in here, the high rise condos and traffic are gone, and you are swallowed by the jungle. They have a walking tunnel to cross FL A1A that takes you right out to the beach! They also have a nice loop drive through the park, through mangroves, Banyan & Live Oak trees, beside bayous and the Intercoastal Waterway. Again, I did not see any alligators or big stuff, but I did see lots of birds and a rangy looking raccoon. If I were an alligator, I would hang out here……. Too soon, our wet trip to Ft. Lauderdale is over. We already miss our grandson and can’t wait to return, rain or no rain! 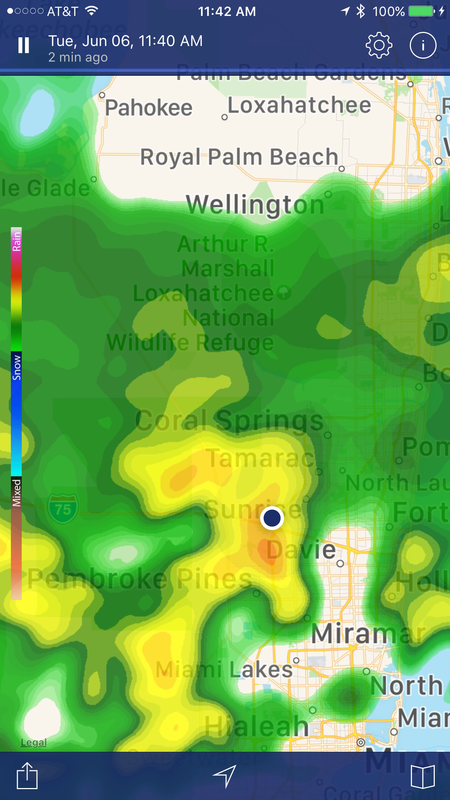 In previous posts, I have told you about the rain that seems to follow us everywhere we go: Kansas City, St. Louis, New Orleans, Mobile, and now, southern Florida. If you follow the weather, most of Florida has been very dry for the last year or more and is classified as in some level of drought ( http://www.droughtmonitor.unl.edu ). Fortunately, this does not include the Miami / South-Eastern Coast. Unfortunately, we brought them rain. About June 5, the rain started. 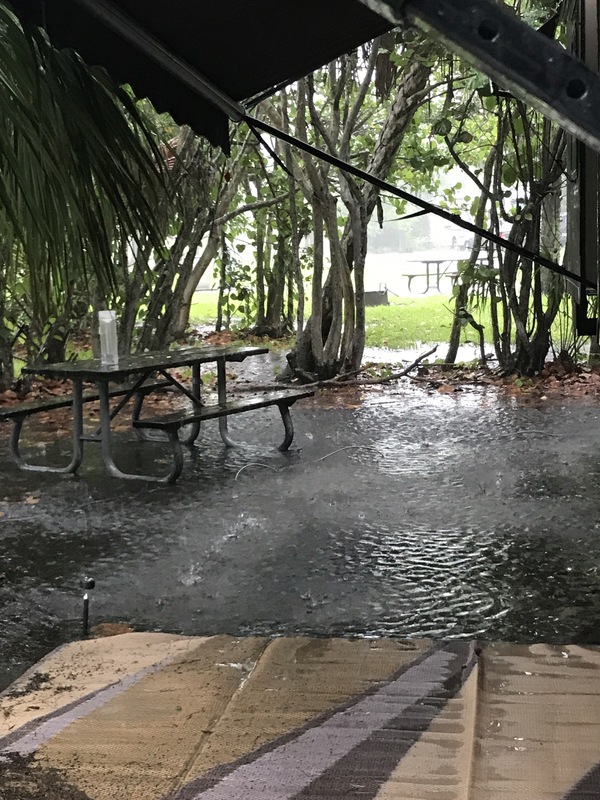 We are used to this southern Florida weather; sunny one minute, 2 minutes of rain, sun back out with humidity about 97%……repeat every afternoon….. this rain just seemed “normal”. When we returned from snorkeling, we moved to a different RV site, back in the back of Markham Park nearer the Gun Range, a site with shade. We had a variety of Umbrella trees, Sea Grapes, Live Oak, and Palms growing around our site and had nice afternoon shade. As the rain continued, these trees dropped lots of debris onto the roof, along with ants. The sandy soil around the site became a watery mess. The rain continued, constantly for several days; we ended up with over 12″ of rain in my old gauge in 6 days. The water rose all around us in the park. The park was closed to everyone, except campers. We spoke to the park staff about moving to a site without trees and with pavement, but they were all “full” although no new campers moved in during the deluge. The roads to the campground were underwater, the canal behind the campgrounds and the lakes rose out of their banks. 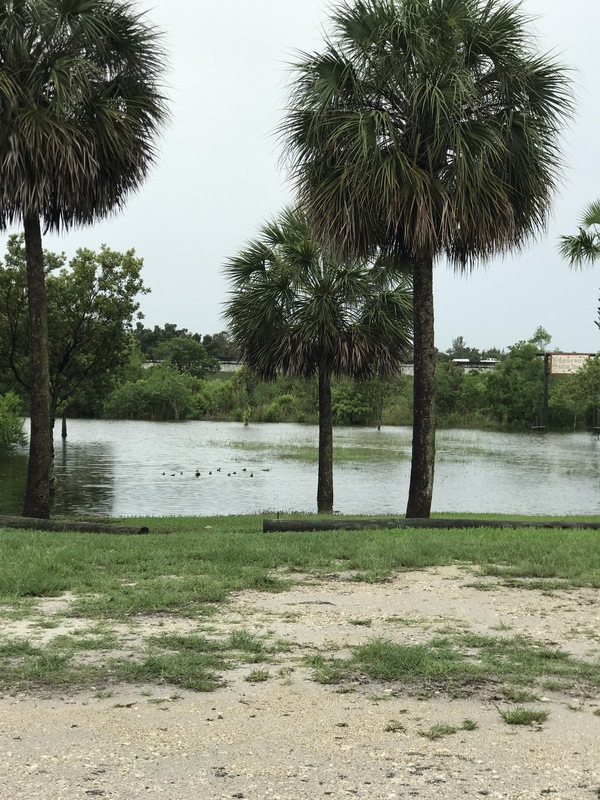 I expected to see alligators at the RV site as the water rose. Nearby shopping centers were closed as the water overflowed the drains and filled the parking lots. Manufactured home communities became islands at each site. It was a mess. Finally after almost a week, the rain stopped, the clouds became lighter, and the humidity, well it is Southern Florida, so it became even more unbearable. But the water did not subside for another week. We continued to drive through water to get to the coach, wade through water to go to the store, and dry off the dogs every time they went out. By the way, there is nothing like that wet dog smell to make an RV feel like home! 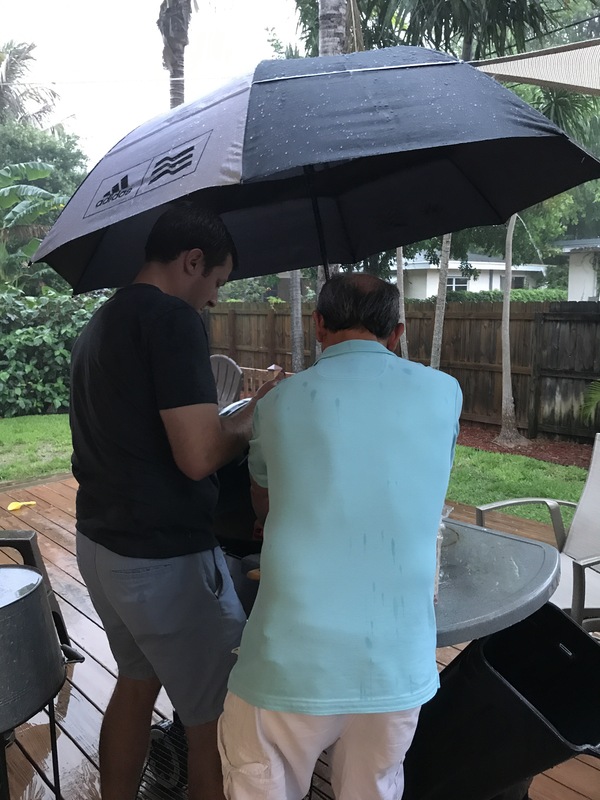 Grilling needs two people: one to cook and one to hold the umbrella! 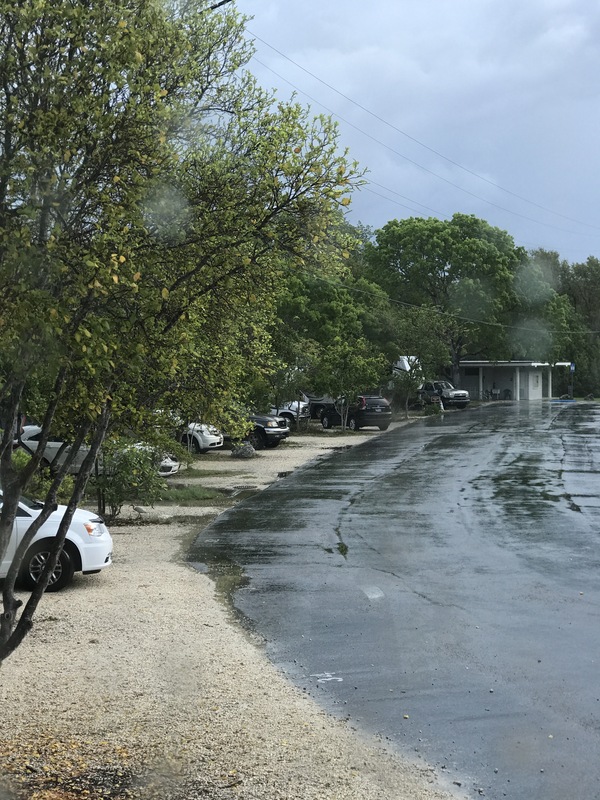 I have been trying since we bought this RV in September to get a reservation at John Pennekamp Coral Reef State Park…..it is about the hardest site to reserve ever! But I finally got a 2 night reservation for Barry’s birthday, and we planned our trip to Florida around it! 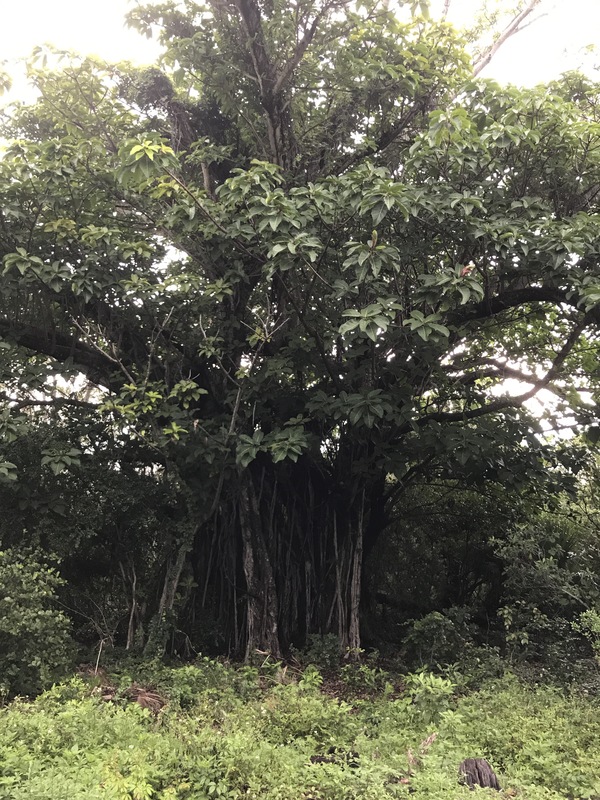 The campground is small with only 39 campsites; but to get there you have to drive through the beautiful mangrove hardwoods and past the dive / snorkeling / kayaking / swimming lagoons! Our site (#37) backed up to the mangroves and was completely shaded by noon…..an important feature in the Keys. We had full hookups and used our WiFi HotSpot rather than the spotty campground WiFi, but our Dish found the satellite easily for TV watching. There is no dog park here, but lots of bags and trash cans for their deposits. Of course, Ratchet took me to the nearest waters edge and waded in to his belly as usual! I was watchful for things that might be lurking in the water though! The shower rooms are clean and nice and the campground is gated to prevent the public from wandering in! Every type of campers were here: big coaches, 5th wheels, campers, even tents. After we checked in, my friend, Cindy and I went snorkeling there. I grew up terribly afraid of water and never, ever put my face under……until about 5 years ago when Cindy invited me to come down here with her to snorkel. I knew my son and Cindy loved to snorkel and thought it was about time I got over that fear…..now, five years later, I will go out of my way to snorkel! 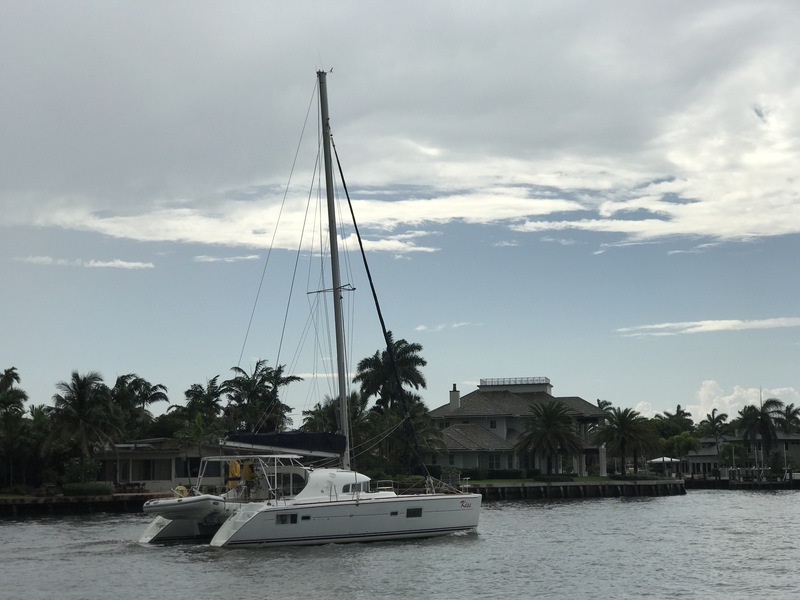 Cindy and I love to come here to John Pennekamp (the $$ is right, and we love the protected reefs here), love the 2.5 hour trips (4.5 is just too long! ), and could float around Grecian Rocks every time! We have been to both Grecian Rocks and Dry Rocks and the Christ of The Abyss area and took a private tour out to Molasses Reef once also; Grecian Rocks is our first choice. If you have not been snorkeling before, it is amazing! It takes about 45 minutes to get out to the reef and we pass over beds of sea grass before the water begins to turn a breath-taking color of light blue/green…..that is the sandy bottom before the reef. The boat moors off the reef and far enough away that he can’t be washed over it to avoid any chance of damage. The boat captain & dive master (necessary for every trip out) have lectured us before we left the dock, as we moved through the mangroves and again, just now before we left the boat about safety and not touching anything or standing up anywhere and, splash we were in the warm, salty water! We saw sea urchins, barracuda, fish of every size and color (grouper, parrot fish, angel fish, I don’t even know what they all are) and so many varieties of coral! Sorry, no cameras or phones on the trip! Afterward, we joined Barry and had dinner at the famous Mrs. Mac’s Kitchen in Key Largo. 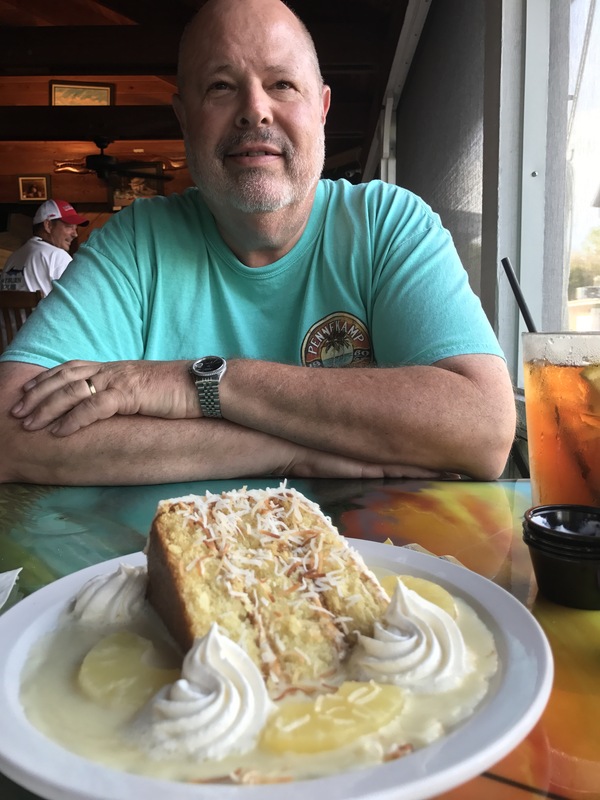 Lobster bites, Mahi was the fish of the day, sweet tea and the famous Key Lime Pie finished our wonderful day! The next day was Barry’s actual birthday, Cindy returned to Ft. Lauderdale, and Barry & I went out to kayak in the mangroves. 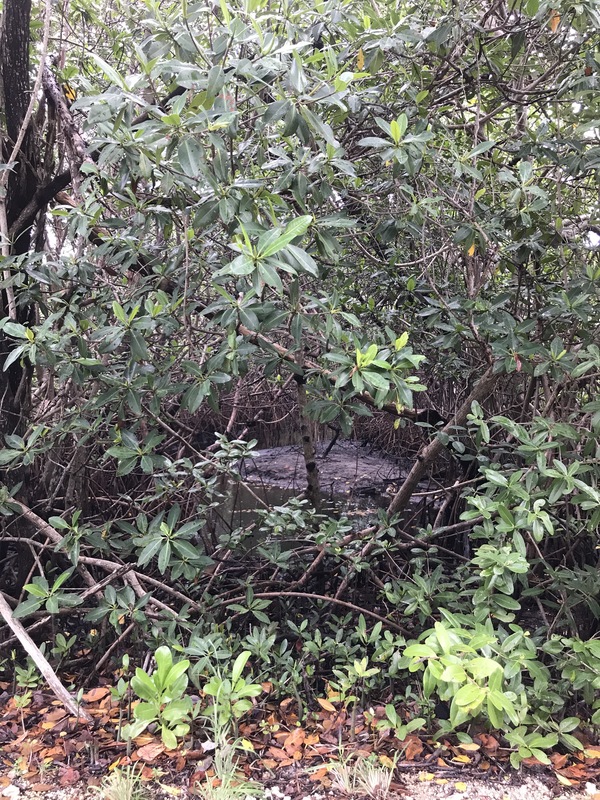 I am not the most coordinated person and fought with my paddle and kayak as much as possible….usually propelling myself into the low-hanging mangrove branches and then trying to figure out how to get out of them! We floated deep in the mangroves trying to see wildlife, any wildlife, but for nothing! No reptiles, amphibians, birds, well, maybe a few fish…..but I was hoping to see manatee! Nope! After a couple of hours, we went back to the RV to shower and rest and walk the dogs before dinner. Barry’s choice for his birthday dinner was our favorite Key Largo place, The Buzzard’s Roost. It sits away from the main road and touristy places, and shares the water with Garden Cove Marina. They have 3 dining areas: A/C, covered screen porch, and an outdoor space near the water. We sat in the porch (less flying insects here) and enjoyed the marina activity while we enjoyed our dinner. The important thing here is the unbelievable coconut cake with warm pineapple rum sauce. Every time we visit the Keys, we stop to eat this sweet treat, and never regret it! During dessert, a fishing boat came in to unload his huge fish coolers, they were full of ballyhoo, a bait fish used by saltwater fishermen. They were small, silvery-green fish with a long “beak” and the coolers filled with fish and ice were full! Our two nights passed too quickly, the skies clouded, rain threatened, and we headed to Ft. Lauderdale to celebrate our grandson’s 2nd birthday! 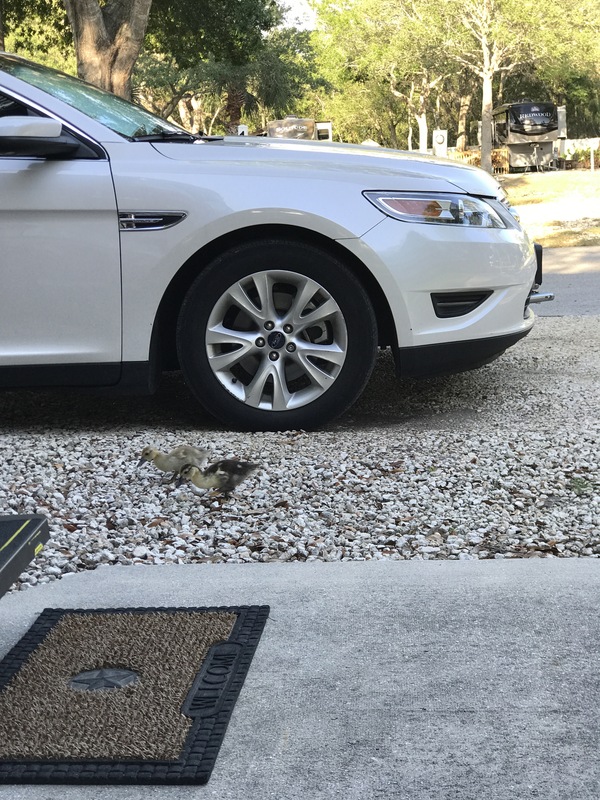 We love Bay Bayou RV Resort in Tampa! It was one of the first RV places we stayed after we bought our RV last year and it made us love RV life. It is an easy place to stay with large trees, concrete pads, full hookups, good WiFi, nice dog parks (one for small dogs and one for large ones), nice clubhouse with mail service, and a great pool. Now that we have discussed that, let’s talk about lovely Tampa Bay. 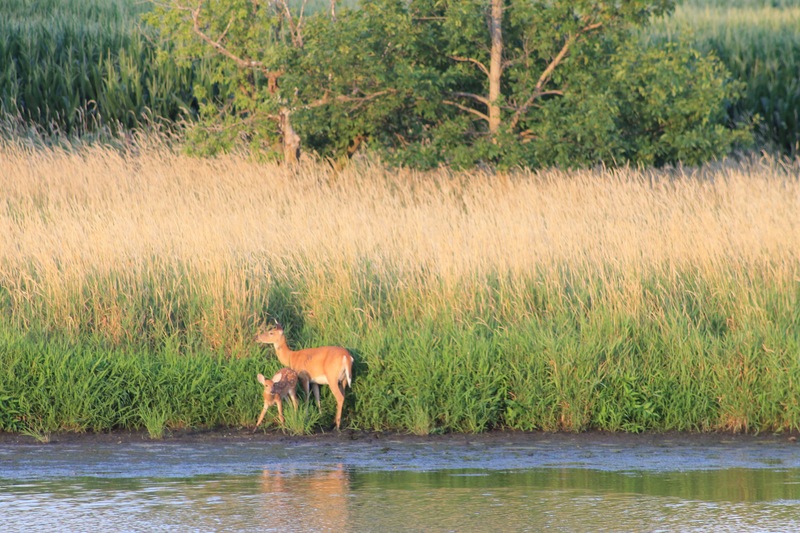 Less than 1 mile from Bay Bayou RV Resort is the Upper Tampa Bay Regional County Park. I rode my bike there one day, it was that close. There are several picnic shelters and lots of space to spread out. 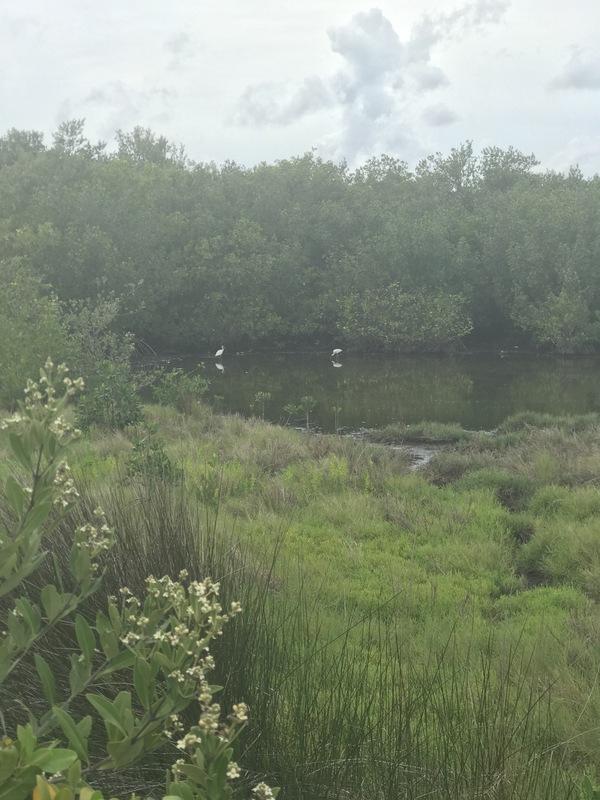 There are several trails that connect to boardwalks, raised trails to protect the fragile environment and keep you dry and out of the mangroves and coastal bay water. The boardwalks even have a couple of places with steps that lead down to the water. I do not know why the steps are there though……I don’t think you would want to swim in this water due to the probable presence of alligators. 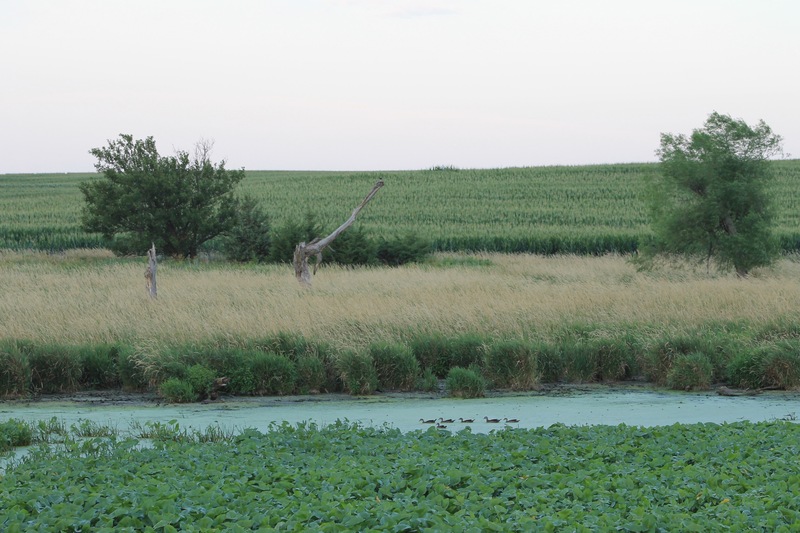 The trails also lead to inland pools with nice places to watch birds. 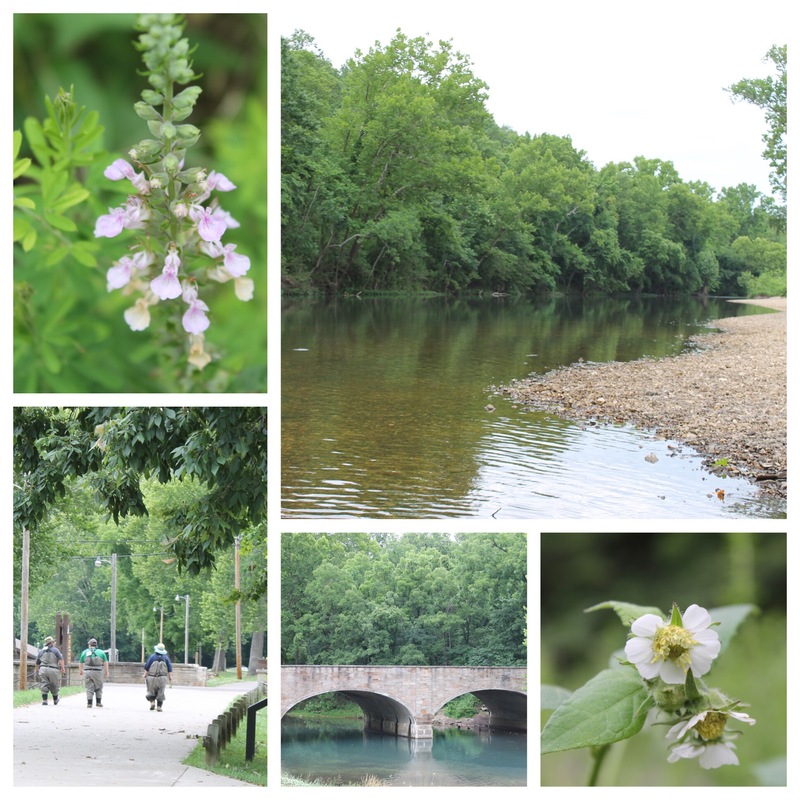 There is a very nice Nature Center in the park; they have tons of exhibits regarding the history of the area, both recent and geological, live exhibits of local fish, and some teaching centers for school trips. 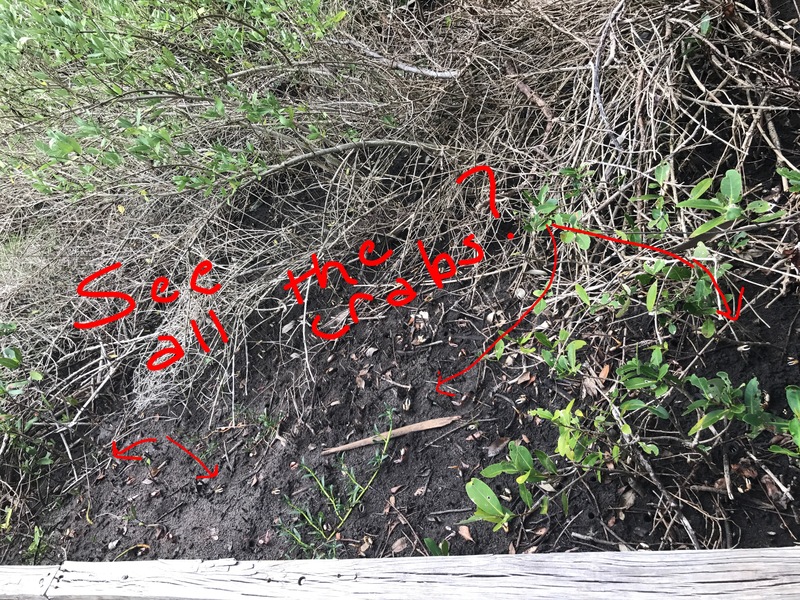 I spotted a giant tortoise on one of the side walking trails, but he vanished into the underbrush before I could get close enough to take a photo. The best part of the park trails was all the little fiddler crabs all along the trails. Another great thing about the Tampa area near Bay Bayou RV Resort is Lobster Haven restaurant. This little place is a market that sells fresh lobster…….great big lobsters……all waiting in big water-filled tanks to go home with someone. There is a front seating area that looks just like a second thought for the market; just added to fill the space. On the other side of the market is a regular little eating spot. Decorated in New Orleans French Quarter style, there is a decent bar and several tables;most diners eat in here. They have The Best Lobster Rolls in Florida. Period. Don’t even ask me twice……it’s just that good. I meant to take some photos here each time we visited (twice in 5 days), but every time the food arrived, we just started eating it all! So sorry, you are just going to have to imagine how delicious those lobster rolls were!